Week two is getting off to a great start in Eagle Nest Canyon. Mother Nature has graced the expedition team with warm weather, clear skies, and fairly low winds. Due to the NE aspect of Skiles Shelter, it gets quite warm in the afternoon so the team has been using canopies to shade the units from the sun for photography and personal comfort. One of the obstacles the team has been facing is how to properly dispose of the large amount of cave dust and loose sediment being exposed during excavation. In order to protect the paintings that line the back wall of the rock shelter, our screening station is below the shelter on the canyon floor. Screening at the base of the shelter eliminates much of the dust circulating around the shelter and prevents the dust from caking on the paintings. The team has also been wearing respirator masks throughout the duration of the work days. If our lungs could speak, they would be thanking us. As for the progress of our excavation, Brooke, Jeremy, Tina, and Jacob have uncovered several diagnostic projectile points from two of the four units that the team has open now. Among the points, the team has also been recovering charcoal, chert flakes, fibrous plant material, bone, and burned rock used in earth ovens. It will be exciting to see what other cultural material lies beneath our feet. Recently the expedition team has acquired a new member. 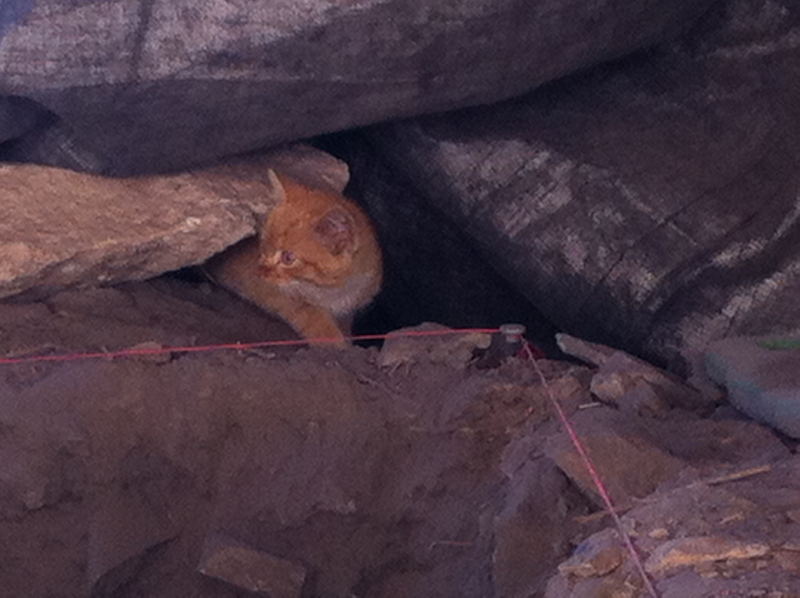 A small orange feral kitten has curiously made its way down into the rock shelter. Dr Black named the kitten “Mistake” after he realized feeding it would only encourage it to stay around. Getting the cat out the canyon before it becomes prey is an ongoing work in progress. We will keep you updated.